If there's one thing I can remember about these days it's Stan Calderwood's opposition to this product that contributed, I feel certain, to his leaving the company. "Jee-zus, Gee-am," he would say in his Chugwater, Wyoming, twang," the goddam movie camera business accounts for only three per cent of the entire photographic market and Land insists on getting into it." Thanks to Steve Phillips of Boston's Phillips Associates for help with the package design. Click on the image above for an enlargement. I tried using the product but it was obviously a turkey compared to anything I was using that Kodak offered and a positive disaster when compared to my 8mm Bolex. I tried with the package design to make it look like a winner. The tinted plasic gave it an unwarranted classy look. 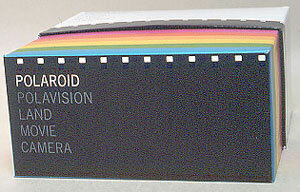 Instant movie film was an engineering achievement but it's precisely what separated Polaroid techies from Polaroid pragmatists. There just weren't enough customers out there on whom to work the magic. Stan Calderwood had confided to me that there would be a $15 million loss to account for. 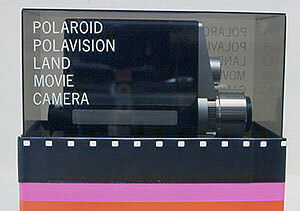 In 1974 Polaroid stock had plummeted to a fraction over 14 as stockolders lost considerably over $4 billion. 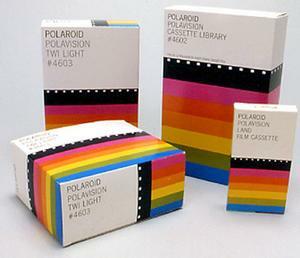 This blow came even as SX-70 sales went through the roof and Polaroid's sales approached $1 billion in 1976. Land's personal losses were $660 million, according to Peter Wensberg in his book, "Land's Polaroid." 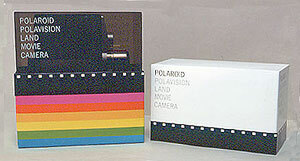 The camera box with its top lid removed, above, and the shelf panel, below.